I shut off the light in my scanner area last night and tried to get a cell phone picture, but it didn't capture what I was seeing with my eyes. Besides the SDS 200, I have two 536's, two 996XT's and one 996P2. The 996XT's had a brighter display than the other four scanners, but they all were visible under a no-light condition including the SDS200. I could easily navigate the key pad on all scanners. Just an observation from the past mobile/base line-up. I like the dimmer keypad. That was one thing I didn't like about the 536 was those silly keys being so bright. That being said I still think the keypad should turn off when the display does. The sds 100 does, why not the sds 200? Menu in the 100 says enable/disable while the 200 is on/off. Wouldn't it be a great idea for the next scanner model to have the keypad backlight being driven from the display backlight circuit, so they both would be adjusted by the users preference? And whatabout a light detector /photocell to help adjust the display backlight in a vehicle when driving into a tunnel or dark area or when you have different light levels in a room depending of if the sun are behind a cloud or not. 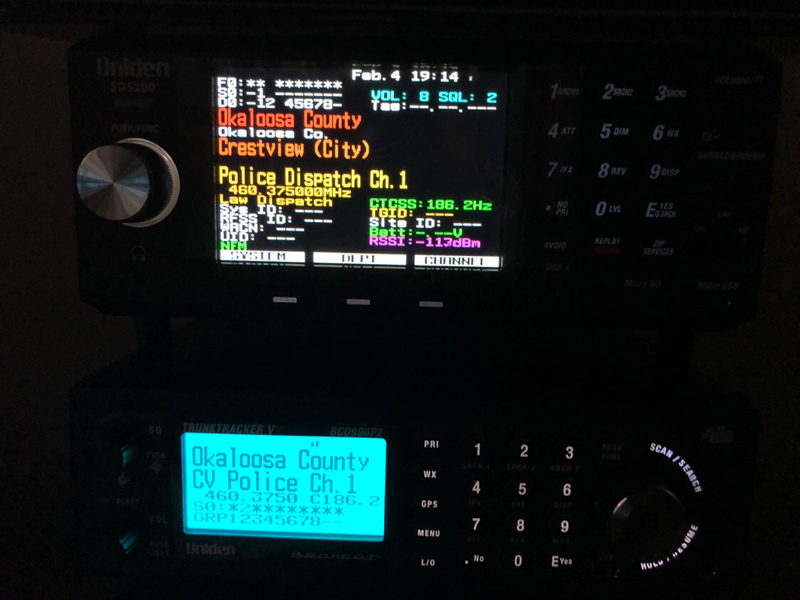 For a mobile radio, I think that you would want the display and keypad illumination to be independently adjustable, and that a fixed keypad illumination doesn't work for various reasons. I can see circumstances when keypad illumination might be too bright, but again some users may require a brighter level to compensate for poor night vision. Then how do you explain the obnoxiously BRIGHT and FLASHING Lan/Link lights on the FRONT panel? Seriously, who thought this was even a remotely good idea? Those lights are FAR brighter than my Keypad, and of no use to anyone. Those lights are pretty much standard on the ethernet jacks of networked devices, and do serve a purpose. However, there are devices that allow those lights to be disabled. Perhaps a firmware revision could address that if the part Uniden used allows for it. The lights are not an issue for me. Or give the user the option to turn off the keypad lighting. I can see circumstances when having the keypad glow while the display is off would be useful. I received two scanners yesterday, one for me and one for my friend who shipped his to my house because I was home yesterday. Our serial# are 1 digit apart. My scanner is the one with the 996P2 and his is the other one. I programmed both scanners with the same settings, keypad backlight on. There is clearly a difference. I was looking at these pics again, prompted by the promo photo of the SDS200 with everything depicted as glowing brightly (including the LAN lights with no cable plugged in). Not only is the keypad backlight very dim, but also the volume knob and the 3 buttons under the display. I just noticed this. see this being a big issue for anyone. For what it's worth my 536HP makes a similar noise and always has. The keypad backlight issue is different - too dim with the lights off in the room. Can't be seen at all in the daytime. I agree with your characterization of the hum/noise "issue" - the only time I can hear it is if I put my ear within inches of the speaker. I can see where this might be an issue with a powered external speaker, but not with the internal or an unpowered external speaker. The unit's audio power is more than adequate in my noisey vehicle. So I got my SDS200 yesterday and so for I love it, BUT, the keypad is definitely not bright AT ALL. The one on my 100 is a lot brighter. My 200 does not have the "hum" problem and I guess I can live with the dim keypad because I don't usually mess with it at night. The only way I would is to toggle systems on or off. Once I have on what I want to listen to I usually leave it scan. The hold buttons are fine so I can stop on a transmission or system or dept if I choose. That being said the keypad should be brighter AND be controlled with the display brightness IMHO.The keypad is hardly visible at night. The volume and clarity of voice on my local phase 2 simulcast system is fine and on par with my SDS100. Still getting everything set up the way I want it, but very happy so far. Here is an ipad pic which basically captures what I am seeing at the scanner rack. Here is a pic I took of mine in total darkness (indoors) with the screen backlight setting on high. Pic taken with an iPhone 8 plus with flash off. Serial # ends 0976. Could it be a little brighter (on par with 536, yes) but it's more then adequate for me. This would be bright enough in a mobile installation as well. 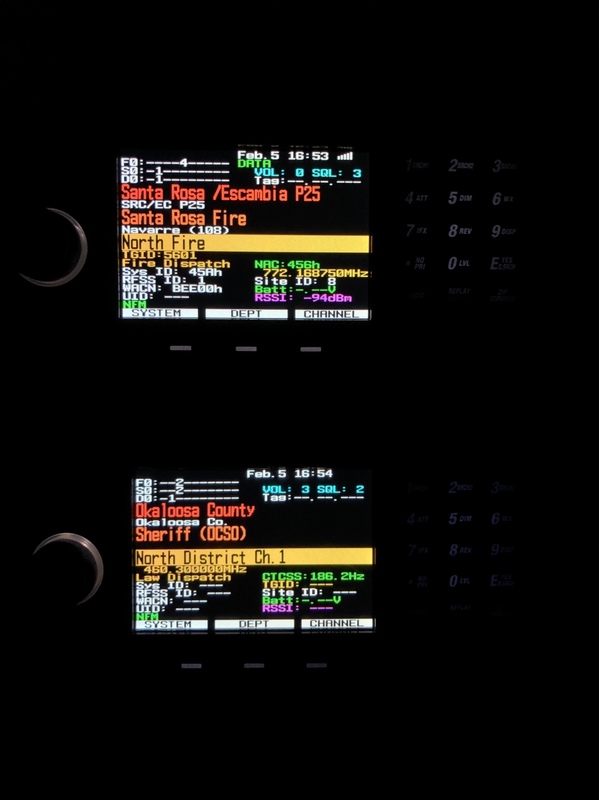 That's is a good representation of the different illumination levels between the radios, and the SDS200 is more subdued than earlier models. The keypad light level looks to be useable in your installation. I would be happy just to get my numbers more illuminated but Uniden isn’t even willing to help anymore. I don’t care about camera settings. The images I posted best represents what I see in a dark room with my own eyes. Thanks Uniden for taking care of your customers. I would be happy just to get my numbers more illuminated but Uniden isn’t even willing to help anymore. I don’t care about camera settings or exposer. This image best represents what I see in a dark room with my own eyes. Mine is the bottom scanner. Thanks Uniden for taking care of your customers. I just still dont understand why or what use the keypad light is since when you press the menu knob the display lights up making the keys visible anyway. Pressing the menu button doesn't change the keypad light brightness on mine, and for me, the display is always on. Still can't see what key is what. That BC780 have a perfectly designed backlight. Your SDS200 have very evenly lit buttons and not like some others that only have light in the middle of the keypad.